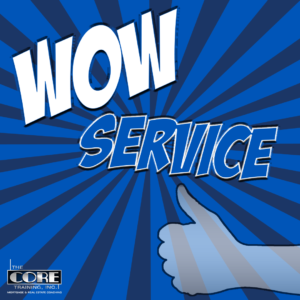 4 Tips to Providing a “WOW” experience to your clients- The CORE way! Home Uncategorized 4 Tips to Providing a “WOW” experience to your clients- The CORE way! Wow Service- such a simple, yet overlooked, phrase and action. You know what I’m talking about, right? When we decide to go out to dinner or even a department store, we expect to have great service. It is EXPECTED that those in any environment who provide a good or service should be catering to our every need. Isn’t the customer, always right? It’s so easy for us to take these things for granted? It’s natural to deem it a necessity for someone in the retail or food industry to WOW us with their hospitality- but what about in the Real Estate and Mortgage Lending business? Being a client, you would probably say, “It’s still important!”. But what about being the Agent or the Lender? Are you upholding the same standards you have for others within the service industry? If your answer is “no”, “I’m not sure”, or even a strong “yes!”, then this article is for you! We at The CORE Training, Inc. take great pride in how we treat our clients and practice what we preach. No matter in what industry you decide to build a career during this lifetime, there will always be a competitor. You can be the most inventive and skillful in your job and there will always be someone trying to be a knock-off version of you or your company. So, what will set you apart from the rest? The answer is fairly simple: value. Did you read that? Let me say it again-VALUE. It’s human nature to want to feel appreciated and significant. When there is no value offered on a product or service, the deciding factor will come down to price. But (as we know with most things in life) the quality of an experience or product will continuously trump the quantity, low cost, limited edition colors, etc. Whether you’re a Lender or Agent, check out a few simple tips below to jump start providing a “WOW” experience to your clients. You only get one chance to make a first impression- so make it great! Be present and in the moment with your client, giving them your undivided attention. Welcome them warmly onsite: A welcome board, friendly staff greetings, refreshments/snacks, and be genuinely interested and engaged in their needs. It’s the personal touches that will set you apart from the competition. How can you appropriately fit a client with their dream home if you don’t know anything about their dreams? The “All About You” form will give you an insight to what the home buyer is looking for (i.e. nearby vet, school, activity center, etc.) so you can tailor their needs, relieve emotional worries, and connect with them on a deeper level. This form will also come in handy on closing day when you’re contemplating what type of congratulatory gift to get your client ? This is one of the most important steps that most fail to complete. After your client has accepted your service, give them an Honor Call thanking them for their business and reassuring them of your commitment and services. “Thank you” videos are also a nice touch, as the client can not only see your genuine appreciation for their business, but also that you’ve taken the time to go the extra mile. Additionally, keep your client in the loop with their home buying process and make your client feel as though they are your number one priority. CELEBRATE! You and your client have gone through this journey together and have successfully fulfilled the client’s dreams. Pizza, balloons, house warming gifts, non-alcoholic champagne; these are fun and thoughtful motions to show your client you care. Providing WOW customer service to clients is such a simple, yet overlooked, practice. Remember: make your clients feel important. It is your number one priority to make them FEEL like your number one priority. Every step of the process from greeting your client on-site to moving day, is important to providing WOW service. You only get one chance to make a first impression; make it great! *The information listed above is only a small portion of what is taught in our level 1 coaching programs. Need more info to take your business to the next level? Visit our website at www.thecoretraining.com or sign up for a free consultation to get started with our 12 Steps to Doubling Your Income online mortgage or real estate coaching program. More posts by The CORE Training, Inc.
What Is a Bench and Why Should Your Business Have One?